The Weather Setup: A slow-moving cold front which had been nearly stationary was over northern IL and IA - but showing clear signs of southward movement in eastern IA. This boundary had been associated with significant outbreaks of severe weather the past couple days, and was now beginning to move into very hot, moist, unstable air to its south. In Missouri and Illinois, surface temps were in low to mid 90s with dewpoints of 75 or higher - and CAPE was approaching 5000 in some areas. RUC indicated continuation through evening of a band of very unstable air just south of front with LI -6 or lower; ETA predicted highest CAPE over NW Missouri and east central IL, with somewhat less instability between - but cold front was punching into the area along Mississippi in NE Missouri and west-central IL, and storms were starting to fire across NE Missouri. I expected that as the front advanced into the warm, moist, unstable air, that storms would move or develop across west central and central IL. Although good upper-air winds were punching into the area, lack of directional shear was a concern. At the surface, winds were mostly light and variable ahead of the front, though behind it the punch of cooler drier air from the north was very evident behind it in the surface data. With such unstable air and such abundant moisture, though, I thought the possibilities warranted a chase. Given the timing of the approach of the front, I thought the Beardstown area NW of Springfield, IL would be the best target area. The Chase: I headed out at 4:45 p.m., north from Edwardsville on I-55. Around 5:30, I noticed some elevated showers to the north, probably around Springfield. At first I could only see the tops, which briefly looked impressive, but as I got closer I could see through the haze that they were elevated, localized, and it turned out, short-lived. Still, they were a sign of the instability in the air. As I approached Springfield the anvils of the real storms became increasingly visible to the NW. I decided to head west toward these storms, having heard a report on the Springfield weather radio that storms were moving through Schuyler Co. and would reach Morgan Co. by 6:00 p.m. I turned west on I-72 around 5:50; shortly thereafter the alarm started going off on the weather radio - but the first two times, the broadcast failed and no information followed the alarm. Perhaps this is an example of why the NWS, including the Lincoln office responsible for this weather radio station, is switching to an automated system. In any case, the third time, the announcement finally came through - a severe T-storm watch had been issued for all of central IL until midnight. By 6:10, I could see very hard updraft towers under the very spread-out anvil of the storms ahead. 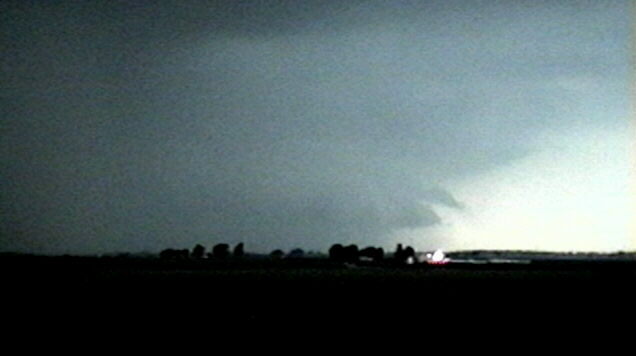 In front of them I could see some kind of mid-level inflow structure, then total darkness toward the horizon. As I was heading straight for the storms from the downshear (east) side, and getting pretty close, I decided to exit I-72 at U.S. 67 just south of Jacksonville - about 6:30. Just as I was about to do this, the alarm went off again - a severe T-storm warning for my location (Morgan Co.) on the storm I was watching. Since the storm was directly to my west and the reported movement was to the east, I decided to try to work my way north of the storm - the updrafts appeared to be on the NW side of the storms. 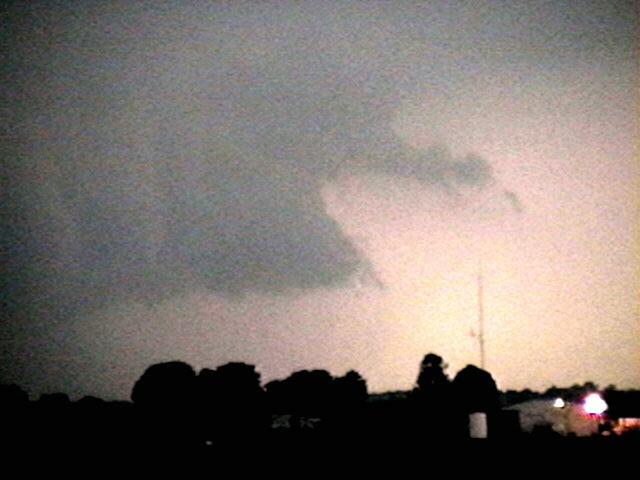 This way, I hoped I could get around the storm and get a better look at the RFB and the updraft area. I went west on the first local road off U.S. 67 to avoid town, went a mile west, then stopped to view the storm before turning north again. I stopped to take a few pictures and get a little video of the very dark rainshaft to my west, which ended abruptly on the north side of the storm, with a little RFB visible to the north. There was now lots of CG, and the storm was looking very impressive as it moved toward me. A very pronounced rainfoot had now developed at the north edge of the precipitation, with a very narrow new rainshaft forming just ahead of it. Here is a video still of these features. I worked my way gradually north and west to rejoin U.S. 67 at the SW edge of town, then followed 67 north at the west edge of town. 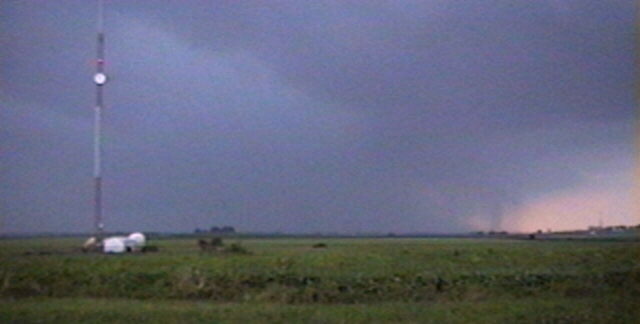 I stopped again to videotape and photograph around 6:40 at the NW edge of Jacksonville just before U.S. 67 turns from going N to going mostly W. The storm was now looking quite ominous, and soon a slight lowering appeared ahead of and north of the precip. At first I thought it might be a wall cloud forming; I could see clear northward movement along the front edge, which suggested the possibility of rotation. 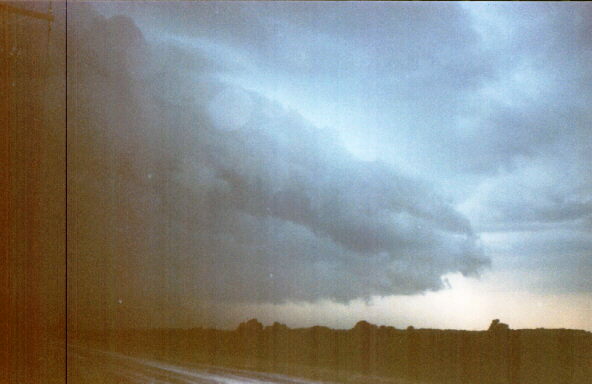 However, it quickly became evident that it was an arcus cloud, not a wall cloud; what I had briefly thought was rotation was in fact northward movement of the whole arcus cloud. 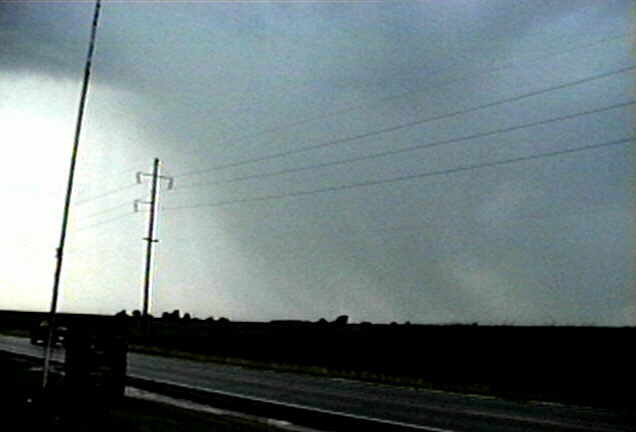 The precipitation core extended to the southeast of this structure, and displayed a definite greenish color, with lots of CG. Clearly this had become a nasty storm, and evidently it was moving or spreading to the NE, not just to the east. If I was going to get around it, I would have to get farther north, which I attempted to do following back roads north of Jacksonville. As I gradually worked my way north and a little east, it eventually became evident that I was not going to get around it. Given the road situation, outrunning it to the east didn't look like a good bet either, and even if I could, I wouldn't be able to get in position to see anything from that direction. Meanwhile, the arcus cloud raced to the northeast, with a very dark, impressive. curved structure filling the sky to the WNW, with its leading edge almost overhead. Around 7:00 I gave up all hope of getting around it, and found protected spot to pull off where the road was a little lower than the surrounding fields of tall corn (way more than knee high before the Fourth of July! 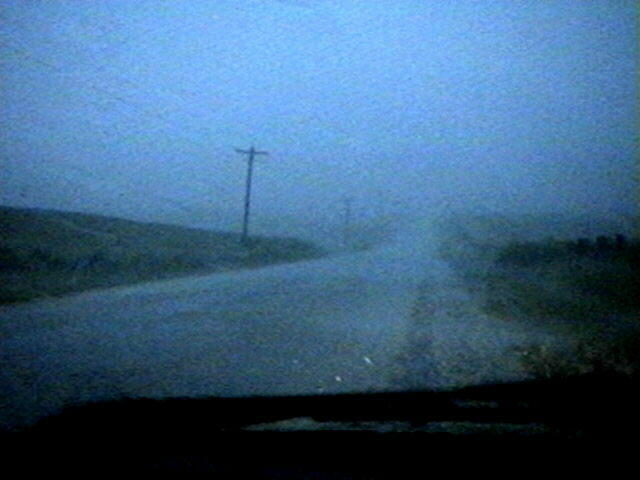 ), and where there were no trees or power poles upwind - and rode it out there, about 3 miles north of Jacksonville. Given the nature of the spot I was in and the fact that the storm was by now clearly outflow-dominant, I felt that this was the wisest and safest course of action. 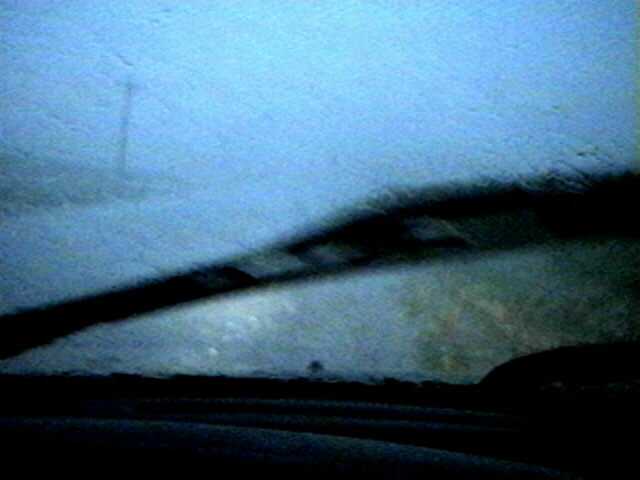 I was engulfed in blinding rain and high wind for about 20 minutes, 7:00 to 7:20 p.m. I would estimate the peak gusts at 50-60 mph, based on experience with past storms and the speed the sheets of rain were flying through the fields around me. Through the whole time the wind stayed SW or SSW, and there was lots of CG all around me. There was a little small hail briefly around 7:15. When the storm had let up by around 7:25, I headed back to Jacksonville to get something to eat. The first couple miles I saw some trees and branches down but cannot say for sure whether they were from this storm or previous ones. In town there were a few small branches down that were from this storm, but the main feature was runoff. I had to drive through 6 inches of water in the parking lot of the local Wendy's, and a trailer court across the street had some flooding. While I ate the sky cleared just enough to show that we were nearly surrounded by storms, with most of the sky except a small circle in the NW filled with anvil. After eating, I drove a few miles NW of town on U.S. 67 and videotaped a new, non-severe, storm that was producing some impressive CG to the NW. 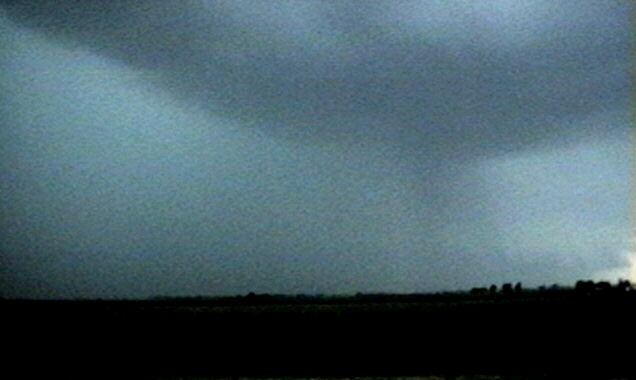 The precipitation shafts appeared to be falling toward the NE - this storm seemed to be moving to the SE but the wind under it was still from the SW, leading to the very slanted rainshafts. To the SW was another storm that looked elevated and had a little CG - didn't look very impressive but I learned later that it did have a severe T-storm warning on it. I started home around 8:30 experiencing light showers and mostly distant lightning most of the way back to Edwardsville, following I-72 east to Springfield and I-55 south to Edwardsville. Endnote: The storm I was on (and eventually in) appears to be the same storm that later blew down a tent in Petersburg, IL, about 20 miles to the northeast, around 8:00 p.m., causing 3 injuries. Although the reported movement of the storm was to the east, it actually moved to the ENE, as I observed from the time the first warning was issued until it moved over me a half hour or so later. The continuation of this direction of movement would have taken the storm right over Petersburg, consistent with the damage report and with the reported location of the storm (4 mi. 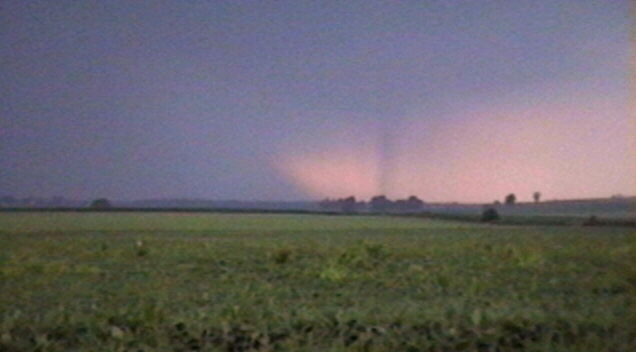 SW of Petersburg at 7:45) when the another warning was issued for Petersburg (Menard Co). Here is the LSR for this and some of the other wind and damage reports from this storm. 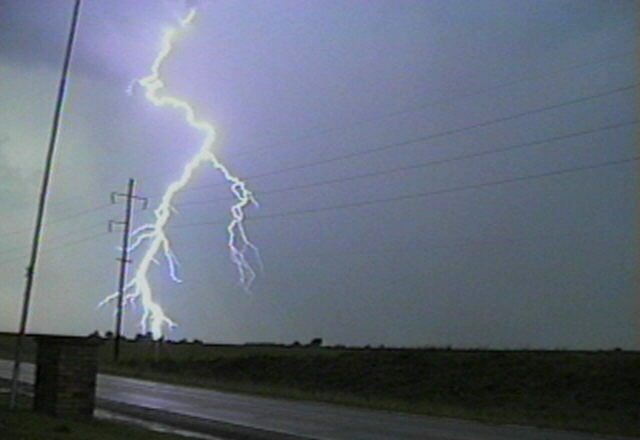 This and other storms continued east across central Illinois, causing 80 mph winds and considerable tree and power line damage over a wide area of central and east central Illinois. Total chase distance: about 245 miles. EFFECTIVE THIS SUNDAY NIGHT FROM 615 PM UNTIL MIDNIGHT CDT. CITY MISSOURI TO 20 MILES NORTHWEST OF BLOOMINGTON ILLINOIS. LAYER SHEAR TO ENHANCE SEVERE POTENTIAL OF STORMS. THUNDERSTORM 7 MILES WEST OF WINCHESTER...MOVING EAST AT 20 MPH. BUILDING AND STAY AWAY FROM WINDOWS. REMEMBER...SEVERE THUNDERSTORMS MAY PRODUCE TORNADOES AT ANY TIME. STURDY BUILDING AND STAY AWAY FROM WINDOWS. FROM CHANNEL 20 AND ESDA. 06/28/98   LOGAN                           EQUIPMENT SHED DESTROYED. FROM 0810 PM TO 0825 PM. ON ROUTE 54 WEST OF CLINTON.